Industrial robotic automation has attracted the attention of industry fearmongers and hopefuls alike for taking over jobs—many of them undesirable in the first place—and bringing new levels of efficiency and workplace safety. Automation technology is now spilling out of industries such as automotive and electronics and into food and agriculture—and it couldn’t be too soon. In the post, Uhl makes an analogy to the wheel that is the food industry and how automation must become the rim tying the spokes together. Uhl asserts that beverage production facilities are using rotary fillers for soft drinks, wine, milk, and water that guide containers into turrets where they are filled by the hundreds—greatly speeding up production lines. Uhl then makes note of how automation is being used today to eliminate contamination in food processing plants with sterile, human-and-bacteria-free production lines, saving the US economy millions of dollars. Finally, Uhl points to the issue of labor costs and associated medical bills associated with injuries developed from repetitive, exhausting, and dangerous jobs and how automation eliminates these problems with uncompromisingly strong and resilient industrial robots. Uhl’s points above are all great ones, but there are two important points to take away from this: Automation’s emergence in the food and agriculture industries is inevitable and already happening, and blue-collar workers in these fields don’t need to panic about job loss. Industrial automation has been an explosive force in the automotive industry, which essentially gave birth to the industrial robot to alleviate employees from back-breaking, demeaning jobs and elevate them into more stimulating, enjoyable, and valuable positions. The video above demonstrates the working conditions for the average Ford automotive plant back in the 1970s. Since the popularization of the lift-assist device to more modern forms of automation in industrial robots, human employees have been exposed to less dangerous work, and production has increased. In the average food-packaging facility, production lines are seeing their fair share of increased productivity and boosted hygiene in systems such as the PicknPack. 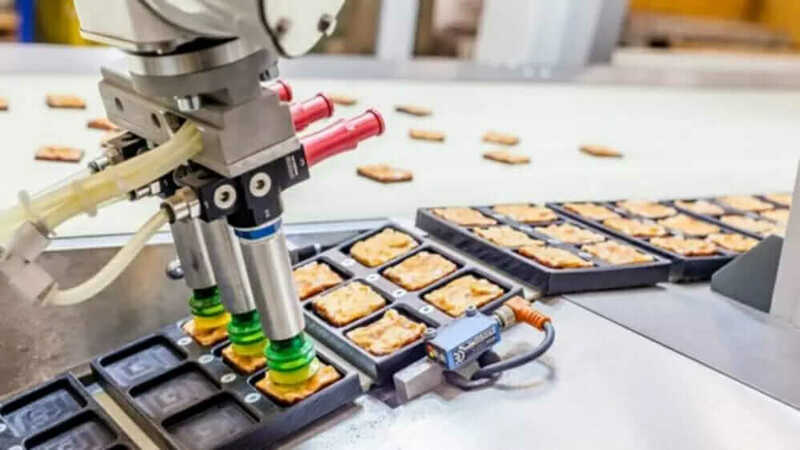 Industrial robots can quickly and easily pick and place food items without risk of introducing bacteria and at a rate far faster and with greater endurance than a human worker. Advanced vision systems even have the capacity to detect both external and internal defects in food products. Loose food products introduced to the line leave packaged and ready for the next phase of the supply chain. Even farming is expected to see a positive impact from the introduction of robotics and artificial intelligence (AI). In what could be considered the upcoming robotic age, farmers can look forward to the use of drones and robotics to tend to their fields and crops. Drones equipped with infrared cameras will monitor irrigation patterns and map soil variations to detect pests and fungal infestations. These drones will be able to swoop in from the sky to perform crop-spraying at any time of day or night. Robots like the Bonirob, from Deepfield Robotics, will perform weed removal, manage plant breeding, and perform other laborious tasks with AI supported by advanced sensor vision technology and image recognition. With the burst in productivity from industrial automation in the food and agriculture industries, it may be safe to assume significant increases in yield and rate of production, with reduced costs for the manufacturer. And hopefully, this will translate to reduced prices for consumers and greater access to food for populations internationally. Say goodbye to that $250 grocery bill! Article by Kagan Pittman. A version of this article originally appeared on engineering.com.